Neil Peet, Supervisor, Marine SAR Programs (CCG-NL) has been presented with the Department of Fisheries and Oceans Deputy Minister´s Award of Excellence. The award is DFO´s most prestigious recognition honoring employees who have made exemplary contributions. Neil Peet´s leadership skills have been instrumental in bringing the Canadian Coast Guard Auxiliary (Newfoundland and Labrador) into the 21st Century. Throughout his career, Neil has contributed to the improvement of the Canadian Coast Guard (CCG), particularly in the field of Search and Rescue (SAR). 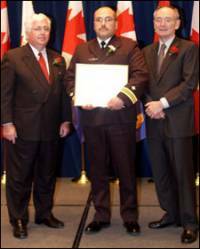 Since 1997, his duties included coordinating and liaison with the Canadian Coast Guard Auxiliary (CCGA) in Newfoundland and Labrador. In fact, he has initiated and supported numerous projects that have had a major impact on existing CCG programs and those of the Canadian Coast Guard Auxiliary. Foremost among his achievements was his role in the regional SAR competition for CCGA members and, more recently, ISAR 2003, which is an international training competition between the Canadian and US Coast Guard auxiliaries. As event coordinator for ISAR 2003, Neil was responsible for organizing the competition itself, the opening ceremonies, the competitors´ and judges´ briefings, the Friday fun night and the awards banquet. On top of this, he secured several major sponsorships for the events, organized a search and rescue exercise between CCG, CCGA and National Defence, and a tour of the St. John´s Coast Guard Base for visiting VIPs. Among Neil´s many accomplishments was his work to secure multi-year funding for the purchase of Search and Rescue equipment including personal floatation devices, survival suits and dewatering pump kits for the Canadian Coast Guard Auxiliary.